Description of "Khair Ye Mere Khayaal Hain"
Writing this book has been more of an impulse or picture a volcano which had been there deep down inside me since long and to which I’ve yielded. This book is a good companion. It may not solve your problems but you will find refuge in its relatable poetic content. You can talk to it, feel it, admire it, even disapprove of it sometimes but its contents will stick with you both in your good times or otherwise. A book’s prime responsibility is to offer a unique perspective to its readers. And this piece of work befittingly does that by surprising you with the poet’s versatile reflections upon various facets of life. This is a collection of poems in Urdu and Hindi which touch upon all my midnight ruminations. 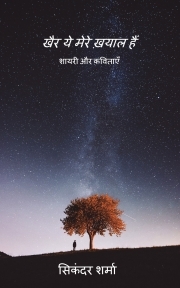 For the sake of convenience for non-Hindi and non-Urdu readers, every couplet and verse has been translated into English to convey its appropriate meaning and salience. I now usher you into a musical journey of soulful contemplations. Bon voyage! The author, Sikander Sharma, is a millennial who lives amidst the maddening chaos of Delhi but finds refuge in writing be it poems, songs or stories. He doesn't believe in the outdated education systems of the country but is a staunch supporter of innovation and free thought. He is a lawyer by profession but is well known within his social circle as a creative artist and an entrepreneur. He's an avid traveller and voracious reader who loves exploring life and talking to people. He's an atheist, inclined towards the Buddhist philosophy and often states that art and science are his only religion. Reviews of "Khair Ye Mere Khayaal Hain"